Austin Eastciders is a booming local cidery that signed up for the Austin Materials Marketplace to discover reuse opportunities for their traditional and non-traditional wastes. Recently, these materials have included a number of construction and demolition materials from a recent remodel. Like many construction projects, Eastciders had surplus materials at the end of the project - 2x4s, plywood, beams, steel piping, conduit, and more. The Marketplace team assisted with taking inventory, creating listings, promoting what was available out to the Austin business community, and identifying potential takers for the materials. The team found a successful match when they reached out Taylor Farm, a small organic farm that offers eggs, meat, and fresh produce. Taylor Farm hosts volunteers to teach them about organic farming practices, and is in the process of creating a housing structure for the volunteers as well as a portable composting toilet. 1,000 pounds of lumber from Austin Eastciders will be used in the construction of these two structures - saving an estimated $1,888 in purchasing costs for materials as well as a reduction in operating expenses of $80/month (the price paid to rent a composting toilet). All in all, this transaction saved approximately $2,000 between the 2 businesses, diverted 29 cubic feet of materials from the landfill, and avoided 1.38 metric tons of carbon emissions that would have been emitted from creating virgin lumber. The Austin Materials Marketplace makes it easy for companies and organizations to collaborate on their waste materials in a way that also creates value for their business, the community, and the environment. Get your business signed up today and see what opportunities are in store for your “trash”. Build A Sign, an Austin printing company, joined the Austin Materials Marketplace to help close the loop on some of their most common byproducts - flag fabric, canvas, vinyl, sticker, gator board, and mesh scrap. The Marketplace team stepped in to learn more about these materials and promote their availability to businesses who could potentially use these materials. After researching these materials and their reuse applications, the Austin Materials Marketplace team cast a wide net to promote them to local businesses and organizations, and hauled in Austin Creative Reuse as an interested taker. Austin Creative Reuse is a local non-profit whose primary mission is to promote conservation and reuse through education, creativity and community building. Since September, Austin Creative Reuse has been making weekly pick-ups for Build A Sign materials. This ongoing transaction has diverted 443 pounds of materials from the landfill which in turn avoided 1.74 cubic tons of carbon emissions from being created. These are some impressive numbers that will continue to grow in the coming year. Build A Sign and Austin Creative reuse are also seeing monetary value created from this relationship. Build A Sign is saving on disposal costs and Austin Creative Reuse is realizing value from selling these materials at a fraction of their retail price to cost-conscious consumers such as teachers and artists. We estimate that around $2,000 worth of materials have made their way through the reuse center and back into consumers’ hands to be reused as raw material. Even if a business recycles and composts, in many cases there are still odd materials that end up in the dumpster. Responsible businesses are exploring opportunities through the Austin Materials Marketplace to minimize costs and environmental impact by recovering these waste streams for higher & better uses - join the program to get involved! 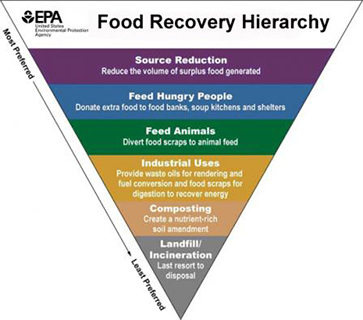 Event company’s diversion efforts generate $10k in value for local nonprofits, help the fight against hunger, divert 1,371 cubic feet from the landfill, and avoid 6.71 metric tons of CO2 emissions. Production Glue, a live events company and participant in the Austin Materials Marketplace, is the recipient of this year’s BizBash Event Style award for Best Sustainability / Corporate Social Responsibility Program for an Event or Meeting for their 2017 SXSW activation for TNT’s Animal Kingdom. This is a big deal. Creating a fantastic event is hard work, and taking measures to be eco and communally conscious makes that job even harder. With the full backing of their client, Civic Entertainment Group, Production Glue went above and beyond, and with our help made a positive environmental impact, helped support our local community, and gained recognition as a sustainable industry leader. As a company, Production Glue has helped set the standard for sustainable practices in the event industry. Sustainability is baked into every part of their process, touching materials choices, logistics, energy use, waste management, execution logistics and final reconciliation. But for a production company working on a national scale, finding local connections to make these goals a reality can be a real struggle. To help fill this gap, Production Glue worked with the Austin Materials Marketplace team early in the planning process of the Animal Kingdom activation to help identify local organizations that could take and benefit from materials from the activation, and easily track and report impact metrics from the effort. Ian’s Giving Gardens and Frutas Frescas was one of the nonprofits that received materials from the activation. Ian McKenna, 12 years old, started his giving gardens to combat hunger in Austin. Any student who comes to school hungry has access to the organic and fresh produce from his gardens. Ian received picnic tables for his gardens to enable students to have lessons outside; tools to increase the yield from his gardens; and a new canopy that he uses to set up a mobile free produce stand in communities around Austin. All in all, seven Marketplace participants accepted around $10,000 worth of materials from Production Glue including furniture, equipment, decor, landscaping materials and more. The reuse of these materials avoided 6.71 metric tons of carbon emissions and diverted approximately 1,400 cubic feet of resources from the landfill. The Austin Materials Marketplace is beginning to engage more with large events in Austin, in part due to Austin Resource Recovery’s efforts to engage city-wide events in zero-waste initiatives. As case studies like this show, reuse of event materials can create a tremendous community impact. If you’re planning now for SXSW ‘18 and know you’ll have bulky, hard-to-recycle materials left over, contact our team for assistance - we’re happy to help! 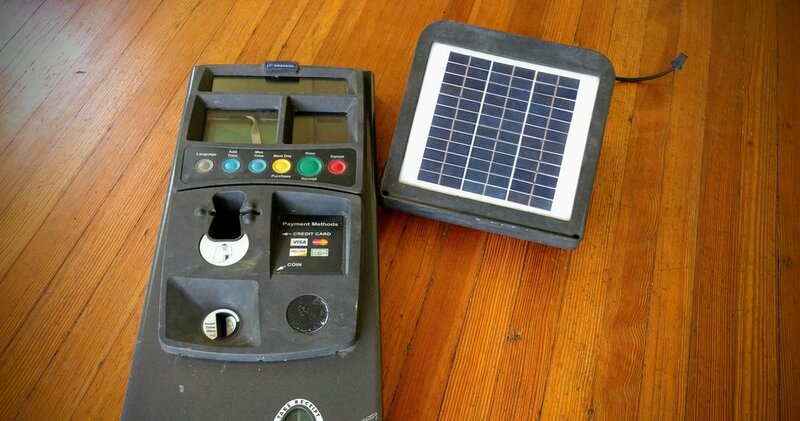 The Austin Materials Marketplace helped the Austin Transportation Department divert these old pay station doors and solar panels from the landfill - saving money and avoiding CO2 emissions. If you’ve paid to park at a City of Austin parking spot, you’re probably familiar with the pay stations that courteously dispense parking stickers for you to slap onto your windshield (that is, unless you’re using the parking app). Well, the trusty towers in Austin's downtown core received upgrades in September, with more efficient solar panels, new and improved batteries, front panels with color displays, and better data-crunching capabilities. What’s more – much of that old hardware is getting a second life! Working with the Austin Materials Marketplace, the Austin Transportation Department has donated approximately 130 solar panels to local education nonprofit Hackstarz. These panels will live on as both energy sources and instructional materials for hackers and makers working with solar electronics. The Marketplace team also enabled a connection to recycle 143 pay station doors, which amounts to over 2,600 pounds of metal and plastic saved! Join the Marketplace program today to help with your business' sustainability efforts. Something about the term hazardous waste tends to make people shudder and scrunch up their nose, which doesn’t help when you’re trying to find sustainable solutions for these materials. The Austin Materials Marketplace team loves a challenge (and to boast a bit when we’ve helped make an impact), so we jumped at the opportunity to help de-stigmatize some of these materials and divert them to a higher and better use. We're ecstatic to share that we helped facilitate a partnership between two awesome Marketplace participants, Smarter Sorting and the Austin Habitat ReStore, that will continually move paints, fertilizers, automotive fluids, and other useful materials from the City’s Recycling and Reuse Drop-off Center to local builders, homeowners, and DIYers. Smarter Sorting, a hazardous waste sorting startup, broke ground on their pilot project with Austin’s Recycling & Reuse Drop Off Center in 2017. Their data-driven technology empowers Household Hazardous Waste facilities to more effectively determine what goes where, which increases accuracy and efficiency. Once the hazardous waste is identified, Smarter Sorting uses the data it collects to identify end-market opportunities for these materials - saving city money and increasing reuse rates. Smarter Sorting joined the Austin Materials Marketplace program in February of 2017, and were quickly matched up with the Austin Habitat for Humanity ReStore, a brick-and-mortar retail chain that sells a variety of reclaimed and reusable materials. This now includes materials that Austin residents unload at the city’s drop off center, often half-full containers of popular wood stains, paints, automotive fluids, and solvents. This partnership is truly closing the loop on hazardous waste streams in Austin by sending reusable products back into the market instead of to the incinerator. To date Smarter Sorting has diverted around 13,000lbs from Austin’s Household Hazardous Waste site to the Austin Habitat ReStore - saving the city & taxpayers around $9,000, generating approximately $16,000 in revenue for Austin’s Habitat ReStore and avoiding a significant amount of carbon emissions. And to make things even better, the ReStore’s revenue will be used to further their mission of providing safe and stable homes for members of our community who need it most. Next time you make your way to Austin’s Recycling & Reuse Drop Off Center to drop off materials you can rest assured that the center will dispose of what they have to in a safe way, and Smarter Sorting’s technology will enable the city to divert reusable products to the Austin Habitat ReStore to be sold at a fraction of retail value. The future is looking bright for hazardous waste in Austin, and Smarter Sorting is looking to build on this partnership and others to bring reusable hazardous waste back where it should be - in the hands of consumers. Gardopia Gardens joined the Materials Marketplace program in late April to source materials to help with their efforts to create a healthier, more educated, and environmentally sustainable community. In May they picked up 105 donated buckets from Austin Business Recycling to repurpose into self-irrigated planters. Gardopia Gardens is handing out these planters to build out the local food movement. This transaction saved Gardopia Gardens around $550 in purchasing costs, diverted 70 cubic feet of materials from the landfill, and avoided approximately .493 metric tons of CO2 - a pretty successful connection across the board. And the icing on the cake is that these materials will be reused in a way that promotes beneficial lifestyles, communities, and food systems. Interested in starting transactions like these that will save on money, carbon emissions, and materials sent to the landfill? Check out what we have available in the Marketplace or get in touch with what you are looking for - we are always happy to help. The City of Austin’s Universal Recycling Ordinance supports Austin’s Zero Waste goal by requiring affected property owners to ensure that tenants and employees have access to convenient recycling. The ordinance also includes an Organics Diversion component which requires food permitted businesses to reduce or divert organic material away from the landfill. Businesses can meet this requirement through various approaches including leaner supply-chain management, composting organic materials, donating edible organics, or by finding reuse opportunities, a specialty for the Austin Materials Marketplace team. Quality Seafood Market joined the Austin Materials Marketplace to develop and implement pro-environment AND pro-business solutions for their hard to divert materials. The Austin Materials Marketplace team has been working on finding reuse opportunities for these materials that save on disposal costs for Quality Seafood while also helping the restaurant meet the organics diversion component of the URO. The team explored several reuse options including loading up empty trucks and sending the shells to the gulf for oyster reef restoration projects, and using ground up shells to enhance soil and animal feed. However, the logistics for each solution have been challenging to incorporate into Quality Seafood’s operations. We were thrilled when Munkebo Farm joined the conversation and brought a new reuse idea to the table - to use these shells as road base. Munkebo Farm picked up 3000lbs of oyster shells from Quality Seafood to use on their farm’s road, which saved on costs for both parties, diverted around .7 tons of CO2 emissions, and created a road made of natural materials that won't leach harmful chemicals into the surrounding environment. Interested in using oyster shells for landscaping purposes? Have another creative idea for materials available in the Marketplace? Login to your account and start a transaction. 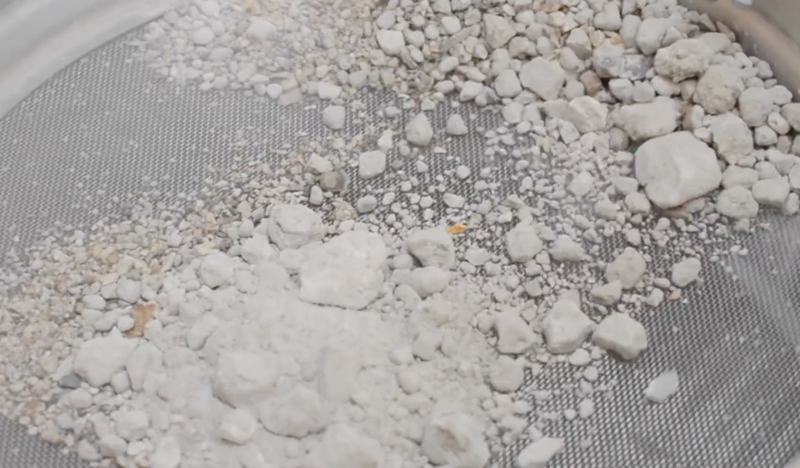 Granite Recyclers Austin is an Austin-based recycling and remanufacturing business that produces solid stone products like fire pits, pavers and split-faced tiles from 100% pre-consumer granite by-products generated by other Austin stone businesses. Their business, which we’ve covered in the past on our blog, plays an important role in helping other businesses in Austin divert waste from landfill and into higher and better use. The focus today though is on another aspect of their business - and that’s the efforts they’re making in their own operations to be a zero-landfill business. The specialized machinery used by Granite Recyclers Austin produces two by-products: granite rubble and cutting sludge, which is dried and sifted to form a dust-like soil amendment. Through the Austin Materials Marketplace program, Granite Recyclers Austin has been able to find reuse opportunities for both of these waste streams, approximately 13,500 pounds so far, including a connection made this week with the Compost Coalition for the granite dust. 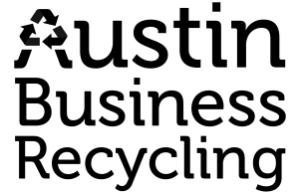 Granite dust contains many nutrients and minerals that can be easily absorbed by plants. This soil amendment improves plant structure, increases resistance to pests and disease, and creates more intense flavors in fruits and veggies. This material was a perfect fit for the Compost Coalition, a grass-roots, volunteer network whose mission is to divert organics from the landfill back into our soil. Last week, the Compost Coalition picked up approximately 20 pounds of the dust to distribute to local community gardens, including a new project to create organic food gardens in underserved areas in Austin. Give us a shout to learn more about getting involved in the Austin Materials Marketplace. The Austin Materials Marketplace network is made up of over 200 eco-conscious organizations, businesses and entrepreneurs; including Austin’s only commercial scale, food-grade cricket farm: Aspire Food Group. Sustainability has deep roots at Aspire; not only in their drive to reimagine global food systems, but also in how they operate on a day-to-day basis. To this end, Aspire joined the Austin Materials Marketplace to discover higher and better uses for their primary by-products: coconut coir, peat moss, and organic cricket feed. At Aspire, the crickets have an average lifespan of a little over one month. At the end of this month, there is leftover feed and nesting habitat materials - peat moss and coconut coir. Like many materials we see in the Materials Marketplace program, we quickly recognized the economic and environmental potential in finding a higher and better use for these nutrient-dense materials. Eden’s Cove Farm, a heritage hog farm focused on building community and sustainability, is one of the participants capturing value from this by-product stream. On an ongoing basis, Eden’s Cove is picking up thousands of pounds of material per month from Aspire Food Group to use as feed for their heritage hogs. So far, the transaction has diverted 7,470lbs from landfill and avoided 5 metric tons of CO2 emissions. Both parties will also save big in 2017 with this ongoing transaction: approximately $12,000 per year in replacement feed costs, and a little over $1,000 per year in landfill disposal and new by-product revenue. To sweeten the pot a bit more, Eden’s Cove is also using buckets from Austin Bergstrom International Airport - found through the Austin Materials Marketplace - to transport and store the feed. Austin Bergstrom International Airport generates an ongoing supply of these buckets; they typically recycle them, but prefer to find opportunities for the buckets to be reused due to the environmental benefits of reuse over recycling. With three different organizations finding reuse opportunities through this one transaction, this is truly a win-win-win scenario. Take advantage of our program and create value for your business today by logging into your Marketplace account, browsing what’s available and starting a transaction. Not an Austin Materials Marketplace participant? Joining is easy - get in touch today to learn more. Apto Solutions, an ITAD services provider, and Liquis Inc., a facilities decommissioning and asset recovery corporation, joined the Austin Materials Marketplace program to buy and sell inventory that might otherwise end up in a landfill. Because of the environmental benefits of reuse over recycling, Apto and Liquis hoped to find reuse opportunities through the Austin Materials Marketplace program to generate value and improve their environmental footprint. Since November, Apto has used the Marketplace to find new markets for many of the materials they’ve made available so far, with almost every transaction generating value and helping Austin achieve its zero-waste goal. Take for example Apto’s recent transaction with Liquis for 19 telecommunication vaults - large plastic and metal boxes used to house and route telecommunications equipment underground. 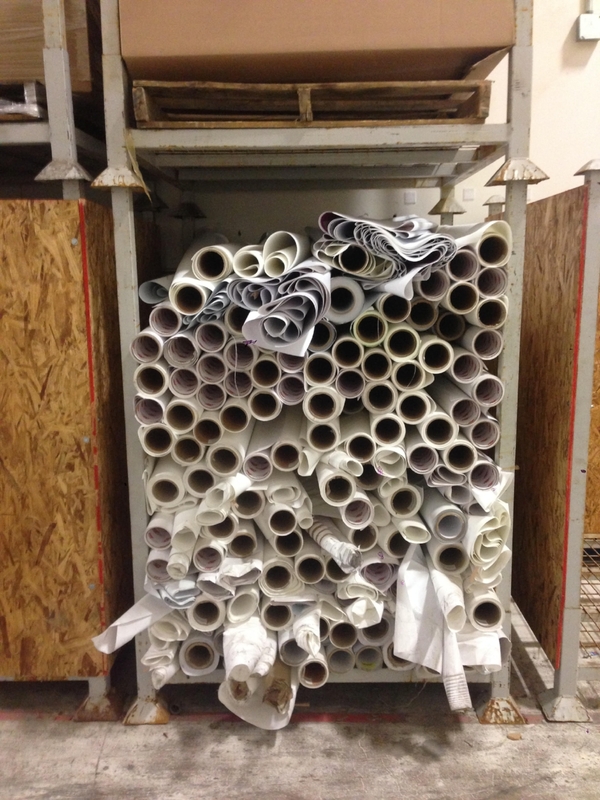 Liquis purchased all 19 vaults from Apto to distribute for direct reuse. This transaction created mutual value for both companies. Buying these new and unused vaults through the Marketplace created thousands of dollars in savings for Liquis. For Apto Solutions, the transaction resulted in the creation of additional value and savings by finding a buyer and avoiding additional disposal fees. This transaction also saved around 1.66 metric tons of CO2 and diverted 554 cubic feet from landfill. As we roll into 2017, we hope to see many more transactions like these that create significant value for program participants, the local economy, and the environment. Login to your Marketplace account now to check out what’s available and start a transaction of your own. Johnson’s Backyard Garden just completed a transaction to provide 3,000 ft of drip irrigation tape to our youngest (and arguably coolest) Austin Materials Marketplace participant, Ian’s Giving Garden. 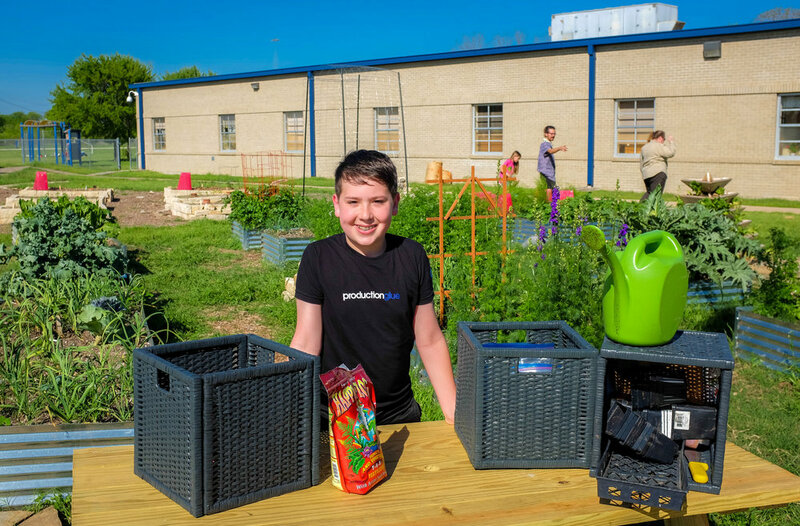 Ian McKenna, 11, has started multiple “giving gardens” around town to grow and donate food to children and families in need in the Austin area. His wonderful efforts are fueled in part by grants from the City of Austin Sustainability Office, Katie’s Krops, the Sodexo Foundation, and others; and we hope to connect Ian to more and more materials resources as his work grows and expands. The Austin Materials Marketplace’s latest success story comes from Strange Land Brewery and Bedford Farm. The two businesses have started an ongoing relationship to reuse Strange Land Brewery’s spent grain as animal feed at Bedform Farm, diverting a significant amount of organic material from landfill each month. This is one of the oldest case studies in the book. All around the world, breweries have their spent grain picked up in bulk by farmers, usually at little or no cost. This is a symbiotic exchange because sending spent grain to landfills is expensive, and farmers rely on this low-cost but energy-packed food to keep their meat and dairy prices low. This is also an ancient tradition, with fossil evidence suggesting that as far back as the Neolithic period (2000 B.C. ), brewery by-products were being used to feed domesticated animals. One of our more unusual trades to date: yesterday Johnson’s Backyard Garden picked up a pallet’s worth of 50lb bags of cornmeal from The Natural Gardener. Unfortunately for The Natural Gardener, weevils had gotten into the cornmeal and it could no longer be used for its original purpose. 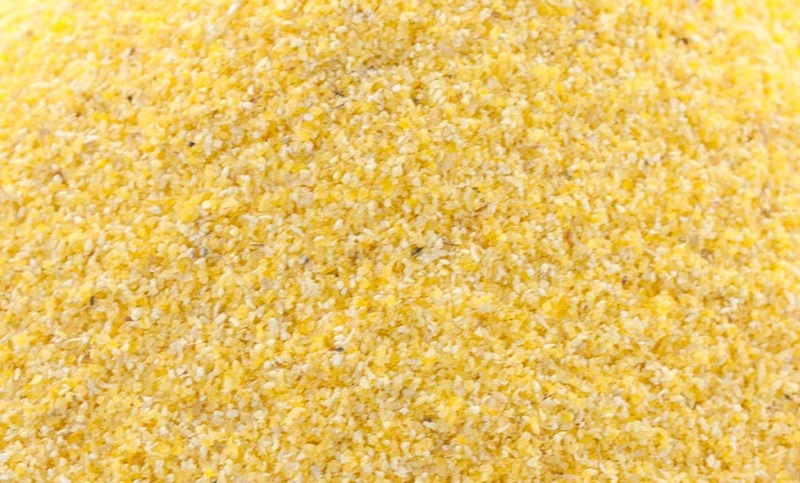 Despite the weevils, the cornmeal could still be useful in certain applications, especially given its nitrogen-rich properties. Johnson's Backyard Garden picked up on this value, and picked up the cornmeal for use around their facilities. This single transaction diverted ~3000lbs from the landfill, in addition to cutting disposal and purchase costs for both parties. 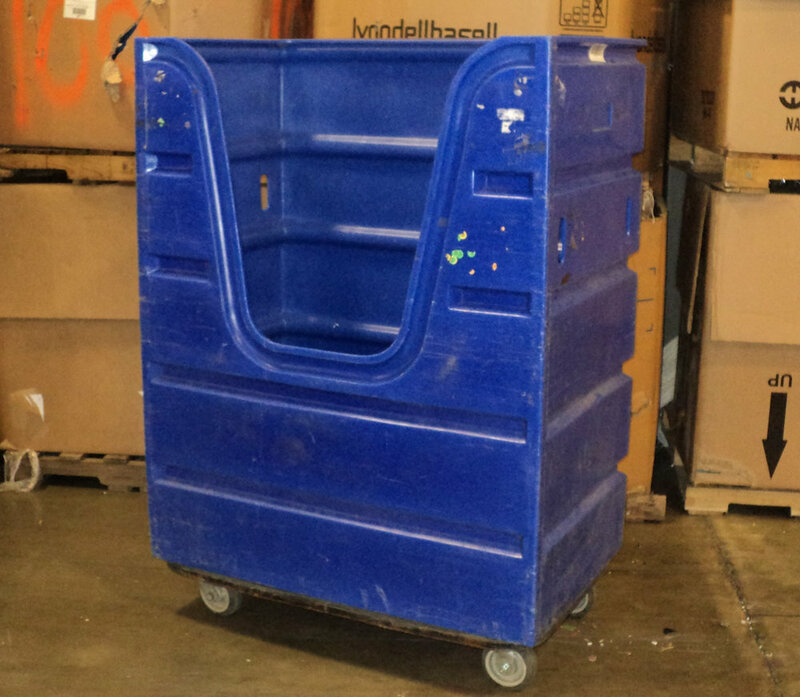 Goodwill Industries of Central Texas had one rolling utility cart available in the marketplace, which found a second life working behind the scenes at the W-Austin. HomeAway had 80 large window shades from one of their Austin offices available in the marketplace. We facilitated a transaction with Austin ShadeWorks to reuse the fabric. Local Austin non-profit Any Baby Can utilized the Austin Materials Marketplace for assistance during their office move in early 2015. We were able to help find reuse and recycling solutions for ~300 cu yards of business furniture, cubicles, and equipment, with most items going to Texas Office Products & Supply (TOPS) located just a few blocks away. Austin Business Recycling donated ~25 plastic 5-gallon buckets to the Compost Coalition, to be reused as organics collection bins. Good work y'all! Diversity Farms, one of our newer participants, has confidently jumped into the program with both feet! In late July 2015 they completed two transactions, one with Johnson's Backyard Garden for ~500 feet of irrigation tape, and one with (512) Brewing for ~300 lbs of spent grain. The irrigation tape was installed in the garden and fruit tree orchard, and created some good learning experiences with the material in the process, which we hope to share with other program participants down the road. We estimate this single transaction was worth about $5,250 to STAR. And while we’re happy about these materials being reused, we’re especially happy to know that they’ll stay in good use keeping additional materials out of the landfill for a long time to come. [progress_bar label="892lbs Diverted from Landfill" color="#6b5101" percentage="100"] General Motors' Austin Innovation Center uses custom monitor mounts for many of its workstations, meaning in most situations, the stock monitor stand is removed and set aside prior to use. We connected GM and Global Environmental Services to make use of these untouched materials, 892 lbs total.